Recently, a lot of emphasis has been made by the Singapore government to encourage Singaporeans to eat healthy. Being good Singaporeans, we thought we should play our part by whipping up some healthier food to share. Hopefully this will encourage us to eat and stay healthy. 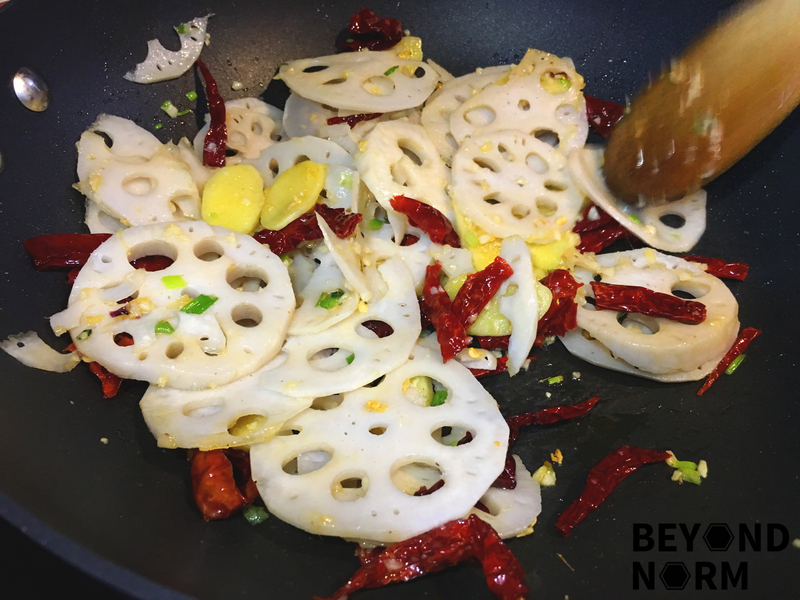 We have tasted Kung Pao Chicken many times but never tried Kung Pao Lotus Root before. Initially we were sceptical but after two attempts, our conclusion was this is an absolute keep!! As my husband doesn’t enjoy Sichuan peppercorns, I didn’t put it in and we thoroughly enjoyed this dish. Lotus roots are rich in nutrients that benefit our body in many ways such as improving digestion, reduce cholesterol, lowering blood pressure, boosting the immune system, and blood circulation, just to name a few. We hope you will try this recipe and be generous by giving us some feedback/comments via our blog. We would also like to welcome you to join our Mummy’s Kitchen Facebook Group for food lovers like you, whether newbie or veteran. You can like us on Beyond Norm’s Facebook Page and subscribe to our blog. Follow us on Instagram and YouTube @beyondnormblog to get the latest updates and videos. Peel the skin of the lotus root. 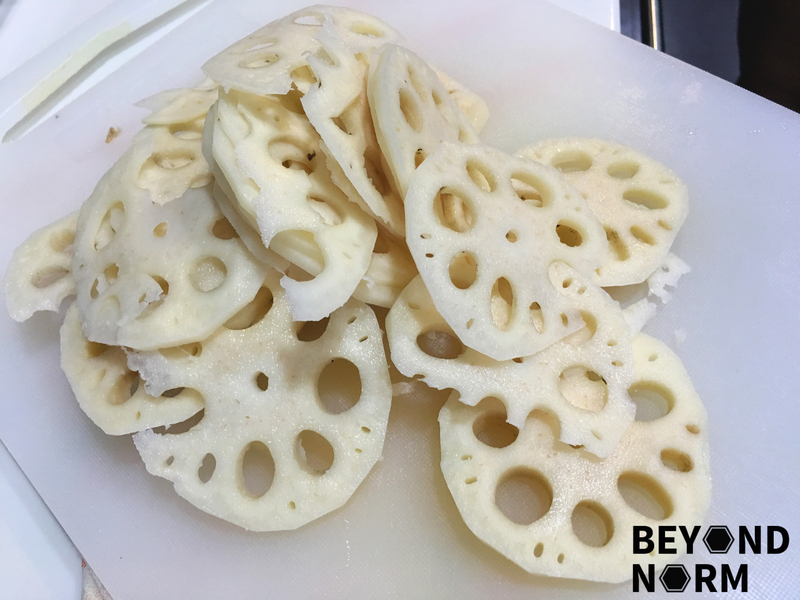 Cut lotus root into ½ cm thick. 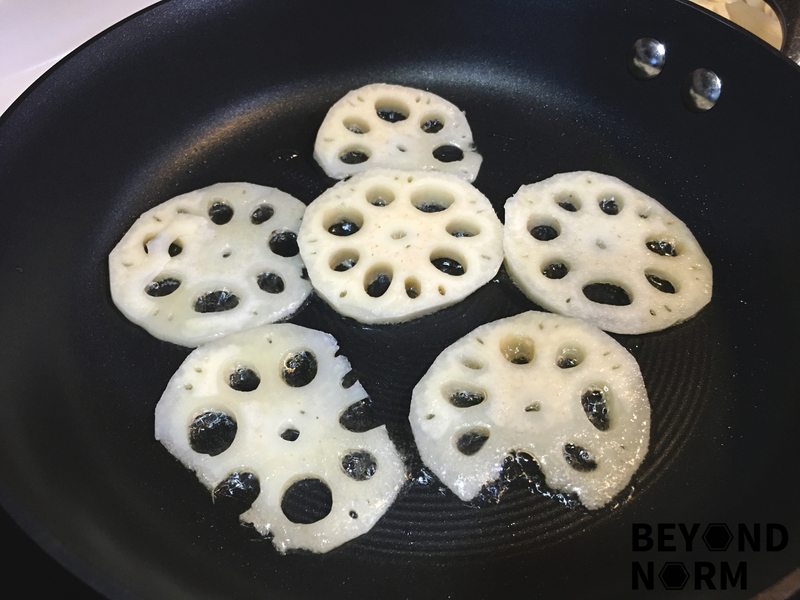 Heat up oil in wok or pan, and fry the lotus root slices for 1 to 2 minutes. Using the same pan, add in the garlic, and fry for 30 seconds. 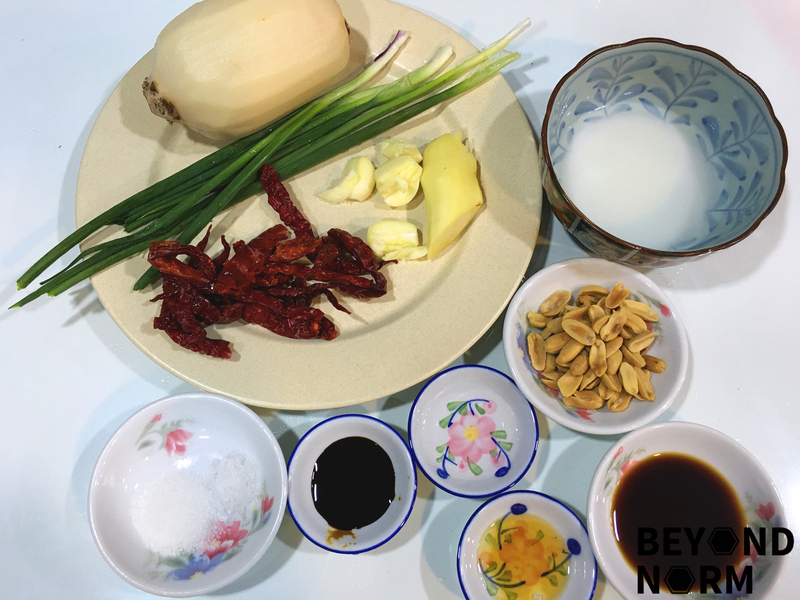 Add in the ginger, dried chilli, and the white part of the spring onions. Fry till fragrant. 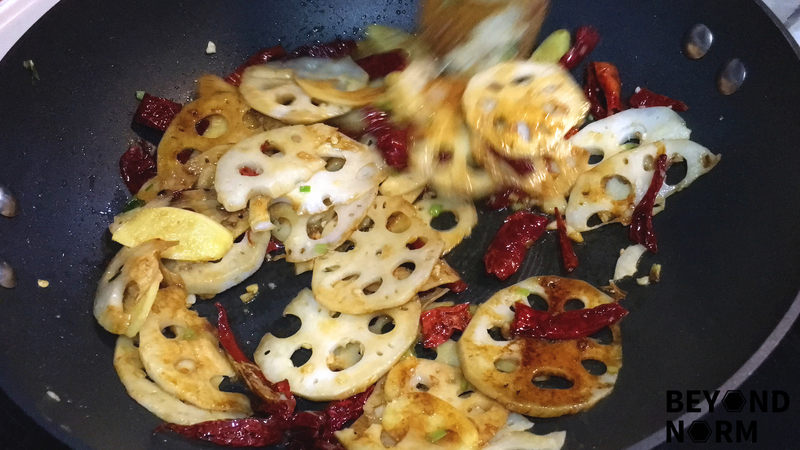 Stir in the pan-fried lotus root pieces. Add in the sauce and mix well. Let it simmer for 1 to 2 minutes on low heat. Stir in the thickening starch and continue cooking till the sauce is thickened. 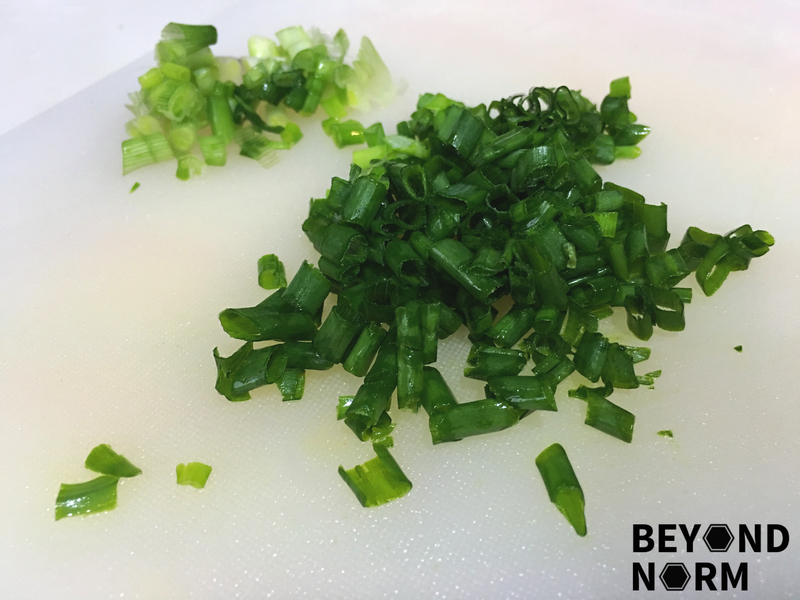 Add in the toasted peanuts and the chopped green spring onions and combine well. Dish up and serve immediately with steamed rice. 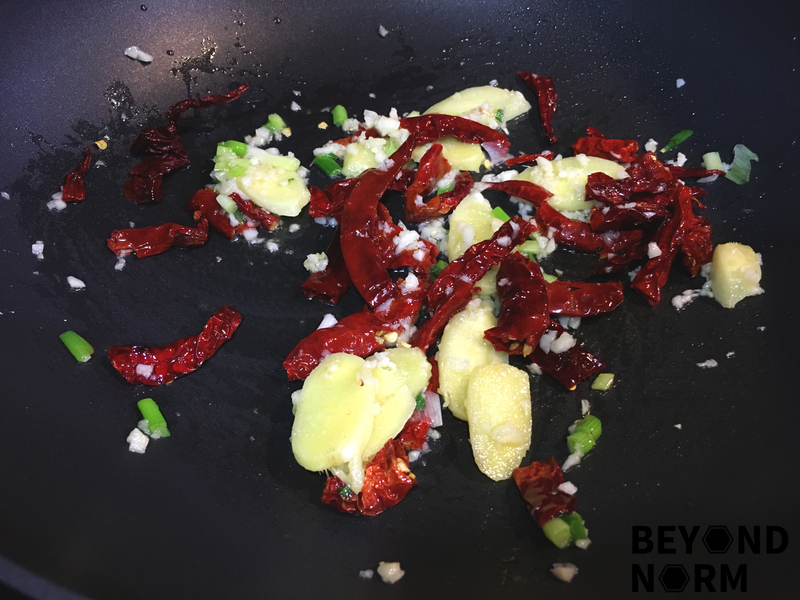 If you are a fan of Sichuan peppercorns, you may add this in Step 6. You may use this sauce for chicken, prawns or squid, or okra/lady fingers, the list goes on.